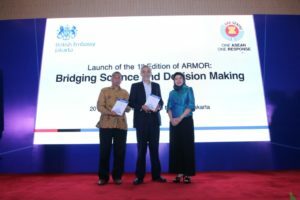 Deputy Secretary-General of ASEAN Community and Corporate Affairs, Dr. AKP Mochtan; the Ambassador of the United Kingdom to Indonesia and Timor Leste, Mr. Moazzam Malik, and the Executive Director of the AHA Centre, Ms. Adelina Kamal, officially launched ARMOR. 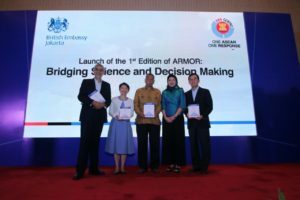 The AHA Centre officially launched the first edition of ASEAN Risk Monitor and Disaster Management Review (ARMOR) as part of its effort to bridge science and decision making. ARMOR is a new resource for policymakers and the disaster management community in Southeast Asia. The report contains ten chapters on the science in disaster management, and how it could be utilised for decision making strategy. JAKARTA, 20 March 2019 – Today, the ASEAN Coordinating Centre for Humanitarian Assistance on disaster management (AHA Centre) launched the first edition of the ASEAN Risk Monitor and Disaster Management Review (ARMOR). The report – which contains a collection of ten chapters authored by disaster management experts and practitioners – provides new analysis and insights on the science behind disaster management and its applicability to policy making. The report titled “Bridging Science and Decision Making” was launched at the DoubleTree by Hilton Hotel Jakarta. The multi stakeholder event was presided by the Deputy Secretary-General (DSG) of ASEAN for Community and Corporate Affairs, H.E. AKP Mochtan; the Ambassador of the United Kingdom to Indonesia and Timor Leste, H.E. Moazzam Malik; Executive Director of the AHA Centre, Adelina Kamal; alongside government officials and partners of ASEAN. DSG AKP Mochtan expressed his appreciation to the AHA Centre for developing ARMOR and expects that the report could contribute to disaster management strategy in the region. “I would like to congratulate the AHA Centre for its tremendous work in providing a critical platform to bridge science and decision making in the region. 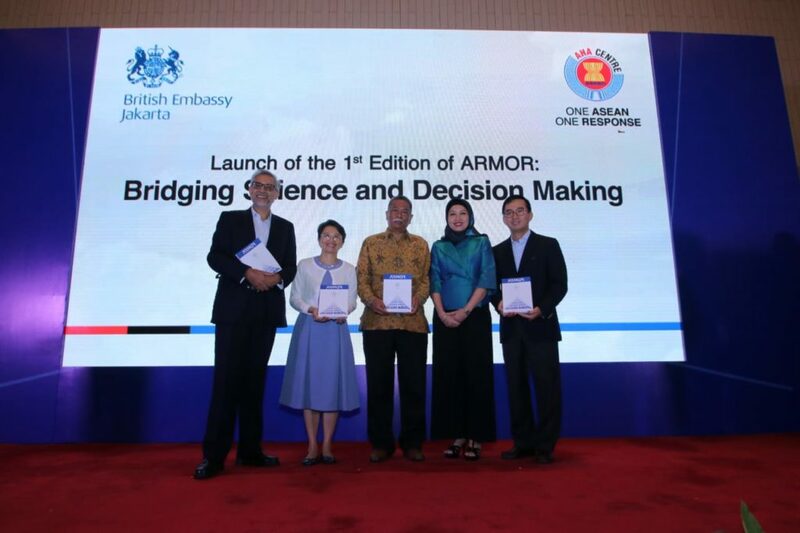 The launch of ARMOR is an auspicious critical step forward to building knowledge in the ASEAN community and a valuable opportunity for ASEAN to re-examine our evidence-based decision-making processes. As one of the most highly vulnerable regions to catastrophic disasters, ASEAN has no other alternative but to work toward institutionalising resilience among its communities and peoples”. The launching event featured an interactive discussion session with contributors of ARMOR: Dr. Mizan Bisri of the United Nations University Institute for the Advanced Study of Sustainability and Mr. Lawrence Anthony Dimailig of the AHA Centre. Guest experts, Dr. Allistair Cook from the Rajaratnam School of International Studies, and Mr. Ray Shirkhodai as Executive Director of the Pacific Disaster Center also provided their commentaries. The session was facilitated by Mr. Said Faisal, the former Executive Director of the AHA Centre, who also served as a member of the Board of Editors of ARMOR. The report addresses the various aspects of disaster management in Southeast Asia today, ranging from climate change, disaster monitoring systems, early warning systems, technological accidents triggered by natural hazards (NATECH), and strategy, policy, and practice in disaster management. Panelists also addressed the ASEAN Vision 2025 for Disaster Management, and how past disaster experiences can inform future prevention and mitigation strategies. The inclusiveness of the ASEAN community is also reflected by a youth contributor, Ms. Juwita Nirmala Sari who wrote a chapter on drought monitoring. She acknowledges that, “I am glad for the opportunity to contribute for ARMOR. My research is about drought detection by using a mobile application. I am sure that youth can play an important role to promote awareness on disaster risk reduction and ensure the readiness for future emergencies.”. The ASEAN Coordinating Centre for Humanitarian Assistance on disaster management (AHA Centre) is an inter-governmental organisation which aims to facilitate cooperation and coordination among ASEAN Member States and with the United Nations and international organisations for disaster management and emergency response in ASEAN Region. The Centre was established by 10 ASEAN Member States; Brunei Darussalam, Cambodia, Indonesia, Lao PDR, Malaysia, Myanmar, Philippines, Singapore, Thailand, and Viet Nam on 17 November 2011, through the signing of the Agreement on the Establishment of the AHA Centre in Bali, Indonesia. The Agreement was signed by ASEAN Foreign Ministers, witnessed by the ASEAN Heads of State/ Government. ARMOR is publicly available at www.ahacentre.org/armor.